Unfortunately, the Brunton Nomad V2 Pro Digital Compass is no longer available. You can explore other items in the Navigation & Compass category yourself to try and find the perfect replacement for you! 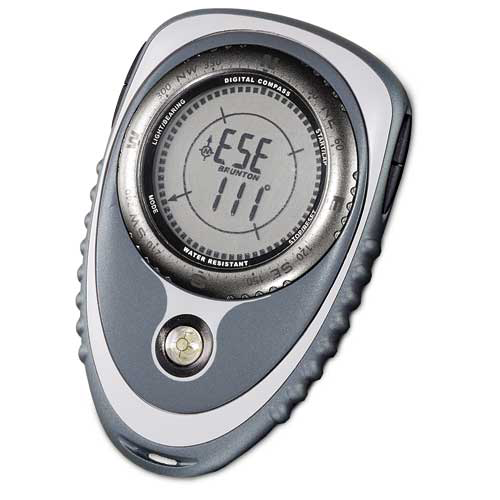 Add weather information like altitude and barometric pressure to the mix and you've got a powerful tool no larger than a traditional compass. You'll get up to the minute temperature readings, a time and date display and two daily alarms. Graphical representation of recent changes in altitude. Unit of measurement selectable between meters and feet. .01 in Hg resolution with working range from 8.85 in Hg to 32.50 in hg Units of measurement selectable to metric readings with 1 mb/hPa resolution and working range from 300 mb/hPa to 1100 mb/hPa. Graphical representation of recent pressure changes. 24 hour barometric data recall. Temperature can be displayed in either Fahrenheit or Celsius. 2 separate time modes can be set to either 12 or 24 hour formats. Displays year, month, day/date, hour, minute and seconds. 1/100-second resolution with working range up to 24 hours. Up to 100 lap/split times can be stored in a maximum of 30 runs. Can you turn the Nomad V2 Pro off to preserve battery life? No, the Nomad V2 Pro stays on at all times. On a fresh new battery it should last roughly a year. What kind of battery does the Nomad V2 Pro take? The Nomad V2 Pro uses a CR2032 Lithium battery. This type of battery can be found at most general stores. How do I calibrate my compass? First, select the compass mode by hitting the bottom left button. COMP will be displayed when you enter the compass mode. To Calibrate you will press and hold the top left button. Hold it in until you see "CAL" on the screen. At this point you will want to set or hold the compass as level as possible. You will rotate the compass two full rotation (720 degrees). Make each rotation last about 20 seconds. This will ensure the compass is getting the proper bearings and measurements it needs to be as accurate as possible. After the two rotations are complete press the top left button again. This will bring you to your Declination Setting. Use the Right side buttons on the unit to change the flashing values up and down. To change what value is flashing simply hit the bottom left button. Once your declination is set, you can hit the top right button to save and exit the calibration mode. NOTE: if you are wanting to just use Magnetic North directions, you can skip the Declination screen and hit the top left button to exit the calibration mode. My compass readings go away and (- - - -) is displayed on the screen. How do I get my direction readings back? To get your direction readings to come back simply hit the Top Right button. This will bring your readings back up for roughly 10 seconds and will then go back to the (- - - -) being displayed. How do I calibrate my Altimeter? First , select the Altimeter mode by hitting the bottom left button. ALTI will come up when you reach the Altimeter screen. Once in that screen press and hold the top right button down. Hold it down until you see the displayed altitude flashing on the screen. You will now use the buttons on the right side of the unit to to change that value up and down. When your unit is set at the desired altitude, hit the top left button to save and exit the calibration screen. You're displayed value should be set. The Brunton Company warrants the Nomad V2 Pro to be free of defects in materials and workmanship for One Year.